Home \\ Blog \\ Why Is Fluid Handling Needed for Manufacturing? Fluid handling systems play an integral role in many manufacturing industries. For facilities that use fluid handling equipment, it’s not enough to have a system in place. Like other parts of a manufacturing facility, the fluid handling system must have a design optimized for efficiency. Improving the effectiveness of a fluid handling system can make the entire facility operate with less waste and greater longevity. When looking into options to make your facility operate better and cut time and product losses, consider upgrading the fluid handling system. Newer parts are designed with greater durability in mind, making them better for long-lasting systems. Better equipment translates to more productivity and efficiency. Piping: Piping must be durable to carry the fluid throughout. The fluid handling designer will choose pipe material based on the temperature and pressure of the liquid carried throughout the system. Fittings: Fittings ensure tight connections between pipes. The connections depend on the material of the pipes. Expansion Joints: In systems with high temperatures, expansion joints help absorb the changes in the material caused by the temperatures. Some expansion joints will also help reduce vibrations in the pipes. Valves: Valves control when fluids pass through the system. The timing of the valves is critical for the operation of the system. Hose: Hose can be made from plastic, metal, PTFE, composite or rubber. The connections for hoses will depend on the hose’s material. For example, metal hoses need welding, whereas PTFE hoses get crimped into place. Which one you pick depends on how you will use it. PTFE hoses can transport liquids up to 500 degrees Fahrenheit, but composite hoses work best for cryogenics and hydrocarbons. Pumps: Pumps help the fluid in the system reach the appropriate pressure to flow through the pipes to its destination. Several industries require fluid handling. The types of fluids used will determine the design of the system. Understanding your industry’s requirements makes it easier for a company to create the fluid handling system your facility needs. Be ready to convey your company’s needs and what you manufacture to get the most effective handling system. 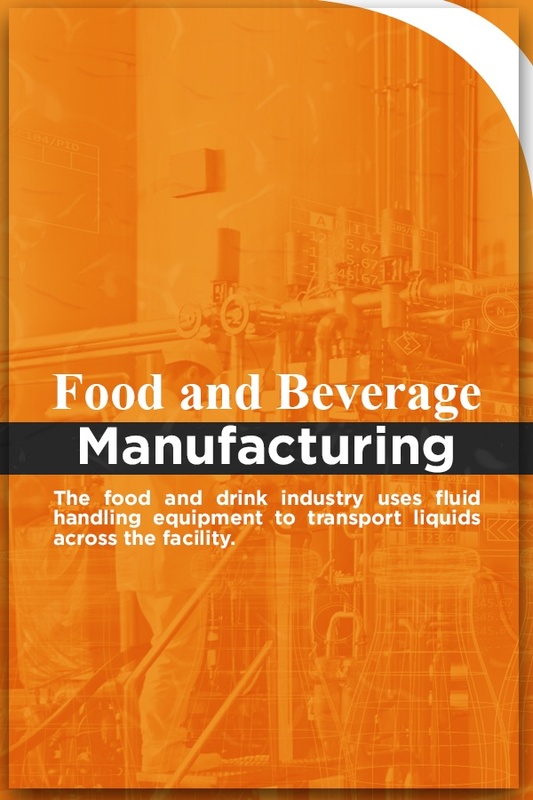 The food and drink industry uses fluid handling equipment to transport liquids across the facility. Predictions made for 2017, suggested that pumps would be the most substantial portion of the fluid handling market due to their numerous uses. Like other industries that use fluid handling systems, the food industry has many applications for pumps, but with additional requirements for sanitation not seen in other sectors. The FDA and USDA require sanitary conditions for systems that transport foodstuffs. Sanitary pumps in the fluid handling system may be jet, airlift, centrifugal or positive displacement types, depending on the force required. The most commonly used sanitary pumps are centrifugal and positive displacement. The latter variety is used for viscous or particle-containing products such as batters, frying oil and deboned meat. Centrifugal pumps are used for moving liquids such as milk, syrup and beverages. Due to their design that allows for sanitary operation, these types of pumps are expensive to replace. Regular maintenance reduces the chances of severe problems occurring. Filters before the pumps, pressure sensors, current sensors and vibration sensors should all be used with the pumps to prevent problems. The data from these will also help you to determine when to schedule maintenance before the pump breaks down, causing downtime. A carefully crafted fluid handling system has proven to save costs in diagnostics. In designing bioreactors, which require oxygen and air pumped into them, a manufacturer was able to settle on a fluid handling system. The system successfully supplied the bioreactor with the necessary gases, including oxygen and nitrogen. The reactor itself is used in research and development in the biopharmaceutical industry. With highly efficient single-use and reusable bioreactors, facilities could lower their costs and reduce maintenance time. These results would not have been achieved had the bioreactors not had functioning fluid handling systems to supply them with air. Another instance of a fluid system used to improve the medical industry is the ACAPELLA-1K. This system can prepare 1,000 samples for DNA sequencing in only eight hours. It processes so quickly due to its multifunctional system of fluid processing. The system combines the abilities to aspirate, dispense, mix, transport and thermally prepare fluids. Upgrading to this newer fluid system allowed the lab to reach processing speeds never seen before. Rising Urban Populations: As more people move into urban areas, municipal wastewater treatment requirements rise. More people will also increase the need for freshwater treatment facilities. Industrial Expansion: Industries produce considerable amounts of waste. Many industrial plants have on-site wastewater treatment facilities. As manufacturing plants increase in size, so will the waste they create as well as the water they need. Both necessitate more fluid handling equipment to take on the larger loads. Energy Concerns: Wastewater and water facilities are under increasing pressure to become more energy efficient. Trading in inefficient fluid handling equipment for more environmentally friendly options will help cut energy usage and reduce waste. Need for Increased Efficiency: Lowering costs for the facility will require greater efficiency. The heart of water and wastewater facilities is the fluid transport equipment. Are you repairing the system more often than you are conducting routine maintenance? Do you need ways to cut costs? Is your system old and wearing down? Do you need your facility to become more efficient? The type of equipment used for fluid handling can determine the level of wear on the system. Several problems with premature wear can be caused by poorly designed or outdated fluid systems. Improving the equipment can reduce the chances for these problems to occur while making the overall system more efficient. Reducing the amount of strain on individual parts and wear on your system will lower downtime and raise productivity. A water hammer can occur in pipes, causing swaying of the pipes and requiring frequent repairs. This issue happens when a control valve opens too quickly. Air can get into the pipes, creating gaps between water amounts. As the water moves through the pipes, the air can push it hard against turns in the lines. The water slams into the pipes at the corners, creating a loud hammering sound, giving the phenomenon its name. A well-crafted fluid handling system will have control valves more precisely timed to prevent water hammers. Additional support at vulnerable turns can stabilize the lines, too. If you have an old fluid handling system, your existing valves may be oversized. Replacing them with correctly sized valves will reduce the wear on the valves and increase efficiency. With oversized valves, the openings are not as wide as they should be. When the fluid flows through the smaller opening, it moves with increased pressure, wearing the valve faster. Oversized valves also have the problem of changing how the system operates. With less fluid running through than expected, the system’s controller won’t tune correctly. An undersized valve is just as bad. It will not let enough flow through the system. The wrong type of valve will also have a negative impact on your system, and changing it out for a better valve for your needs will increase efficiency and reduce wear on your whole system. For example, vertically using a floating ball valve without enough pressure will cause the system to leak, reducing its efficiency because the low pressure will not allow the valve to seal. A material that is incompatible with the liquid in the system will also wear out early, especially with high temperatures and caustic substances. For instance, a carbon steel valve cannot be used with sulfuric acid because the acid will eat through the carbon steel. With components designed to wear out less frequently, you will enjoy lower maintenance costs and the subsequent downtime from repairs. Older systems will need more frequent maintenance due to wear on the parts. If you upgrade to a newer fluid handling system, you will have pieces that have not worn out. Modern components are also designed to have longer intervals between repairs. By upgrading to more modern fluid system parts, you’ll lower your maintenance costs. One example of this is the bearings used in contemporary fluid pumps. These bearings are designed to last longer than older models. Another way newer bearings makes a difference is the type used in the pump. For instance, tapered roller bearings steal energy from a positive displacement rotor unlike angular contact ball bearings, which are much more efficient. Changing the bearings in a pump is a small way to improve the operations of a pump and the entire fluid processing system. Filtering fluids before they enter your system reduces the chances of contamination that can ruin the system. With filters installed, you can remove sediment from the liquid in your system, which can help reduce failures — as well as cut down on the maintenance time and money you must spend to get your fluid handling system back up and running. When your fluid system experiences an unexpected shut-down, you will lose productivity during the downtime. With a more reliable system, though, you won’t have as much downtime to repair problems. Increased reliability means more time for your workers to do their jobs. In addition to saving time, new fluid handling systems can cut product losses. Inefficient systems that leak can cost you in lost product. The investment in a new liquid or gas handling system can prevent product losses and time wasted. A specific way liquid handling systems waste products is the case of open systems. If you currently have an open fluid handling system, you risk spills of costly and potentially dangerous substances. With a closed system, your workers can more effectively empty a drum. The amount of liquid that can be drawn from a drum in a closed system is 99 percent or higher, reducing unused fluids at the bottom of storage containers. While using more product from a container is helpful, your employees’ time is handled better. A spill from an open system requires immediate cleanup. A worker who has to stop what they are doing to clean up a spill loses efficiency. By preventing spills and getting more liquid from the container, closed fluid handling systems automatically increase productivity while reducing product and time loss. SEMCOR has the solutions for manufacturing facilities looking to install fluid processing systems. We also have the components necessary to upgrade fluid handling systems. Find everything from valve modifications to expansion joints and pipe fabrications. We carry products for all industries, including sanitary parts for food manufacturing and chemically resistant components for pharmaceuticals. If you cannot locate what your facility needs on our website, we do offer customization for most parts we sell. Tell us what you need for your facility, and we will work with you to create the components you require. Our service area includes the Midwest up to a 300-mile radius from our base in St. Louis, MO. Contact SEMCOR for solutions to any manufacturing fluid handling system needs. For more information about us, our product line and prices, you can also use the same contact form.